We lost Jack to bloat. 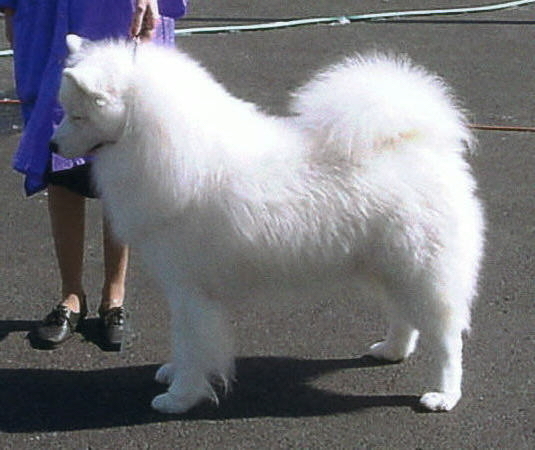 He was a lot of firsts for us, first Samoyed, first show dog, first champion. He changed our lives forever and will always live and be loved in our hearts. Bloat is one of the biggest killers of giant breed and deep V chested breed dogs. No one knows what really causes bloat, but there are many theories. Please read up on the warning signs of bloat, there are many different warning signs. Acupressure Bloat Point - by C.A. Krowzack, DVM - This is the one most important bloat link that you could ever have. Bookmark this page. Print out a copy and keep it handy. If a dog bloats, this is the first thing to do - massage the bloat acupressure points on both back knees. It works! I've saved one of my personal Danes 3 times by doing this alone. Two of our foster homes have saved two other Danes using this method. Please note - this is not a substitute for taking a dog that is bloating into the Vet. Get the dog to a Vet immediately! But, if you catch the bloat quick enough, hopefully, there won't be much, if anything, for the Vet to do. Feel free to email me if you have any questions! Canine Bloat - from Great Dane Rescue, Inc.